Quick and transparent service is vital to maintaining a good working relationship with your customer. Email, fax, social media and other non-real-time communication are patient, but you want to engage your customer immediately upon receipt of a request. OTRS allows you to respond to a customer immediately upon receipt of a request giving the customers instantaneous feedback assuring them that their request is in processing, establishing expectation. 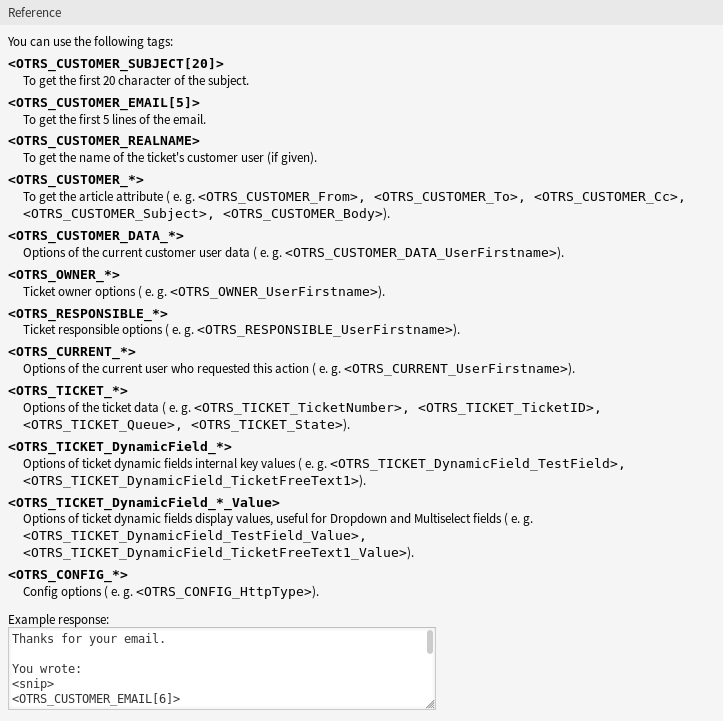 Automatic responses can be sent to customers based on the occurrence of certain events, such as the creation of a ticket in a specific queue, the receipt of a follow-up message in regards to a ticket, the closure or rejection of a ticket, etc. 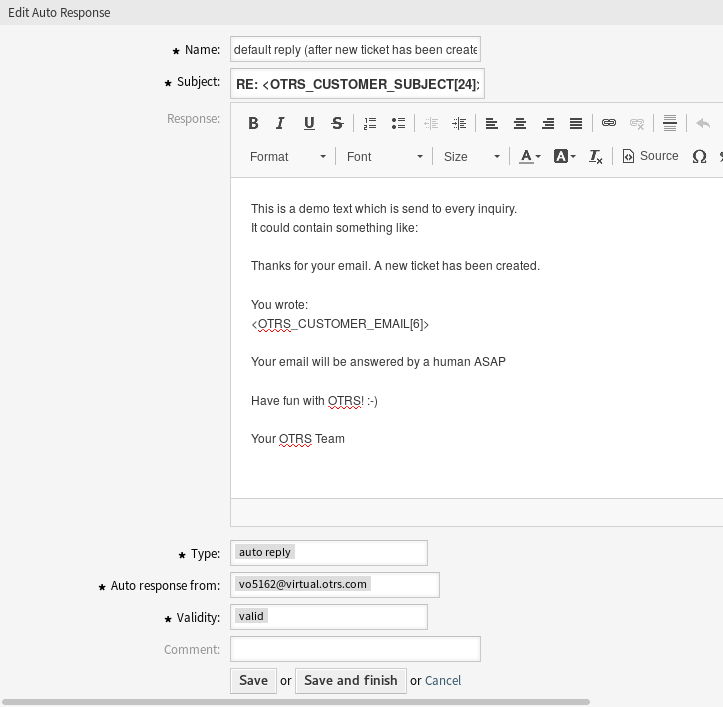 Use this screen to add automatic responses for use in queues. A fresh OTRS installation contains some automatic responses by default. 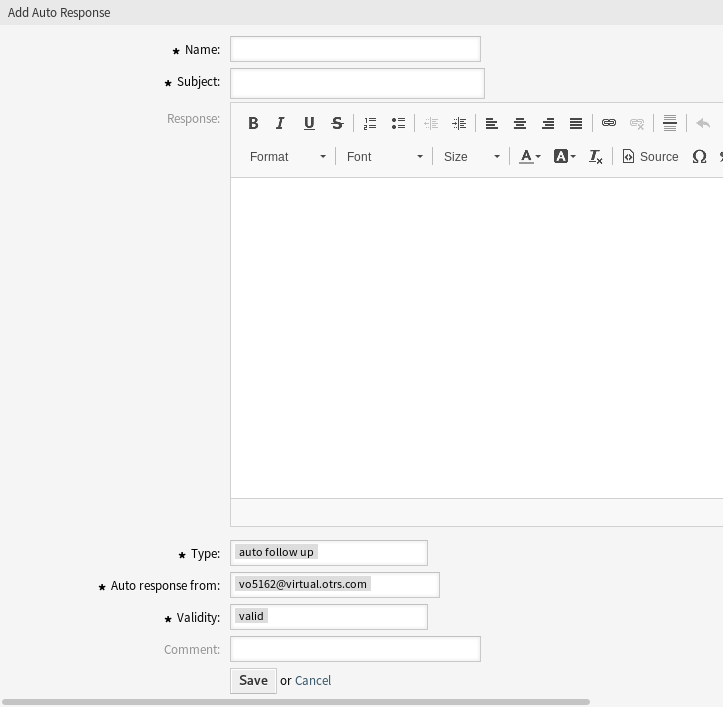 The automatic response management screen is available in the Auto Responses module of the Ticket Settings group. Adding automatic responses requires a valid system address. Create system addresses in the Email Addresses screen. Click on the Add Auto Response button in the left sidebar. Auto responses can not be deleted from the system. They can only be deactivated by setting the Validity option to invalid or invalid-temporarily. Click on an automatic response in the list of automatic responses. If several automatic responses are added to the system, use the filter box to find a particular automatic response by just typing the name to filter. Confirms receipt of the follow-up. The message rejects a customer follow-up. Deletion of a ticket, done by the system. A newly raised ticket will trigger this auto response. This message informs the customer of the new ticket number. The sender email address, from which the automatic response will be sent.